Its official, on the 20th of December 2008, Soul Singapore will gather at SAFRA Toa Payoh to compete and crown a champion to bring us into the new year. Being our first Soul Calibur IV Event, we’re hoping for it to be bigger and better than any other tournament we’ve held before. Finals Side/Stage Select: Both Given to Winners Bracket Champion. What if I have “Stage Advantage” and wish to choose a random stage? If both of you are playing on a console WITHOUT the 3rd Star Wars stage, feel free to select random stage. However, if the machine you are playing on has got the 3rd Star Wars stage, you will be provided a d20 dice to toss. The number indicated on the dice will correspond with a pre-prepared stage chart, and you can “manually” select your “Random” stage. I can only use the PS3 pad, and my opponent can only use the Xbox360 pad… What now? If time and resources allow, we will rearrange your brackets. Otherwise, both of you will be forced to use the next available console, even if it means one of you has to use a controller you are not familiar with. Do note that usually tournaments run on a single platform, meaning a fair number of players have no choice to adapt to a different controller to begin with. This event is run on both platform due to lack of resources. This is an event run by the community for the community, as it is, the $5 tournament fee is to help cover the costs of renting the room and transporting the equipment and it is barely enough. Still, we hope that everyone can come together to enjoy the game and we apologize for being unable to provide any form of recognition or reward for the winner. They are the FINALS! They deserve a little more attention and drama to them. Also, as a reward for not losing a single match prior to the finals, the champion gets to choose which side he plays on automatically, as well as the first stage to play on. Consecutively, the stage will be chosen by the loser of the previous round. That is ALL folks. Thank you for reading and we hope to see you there! 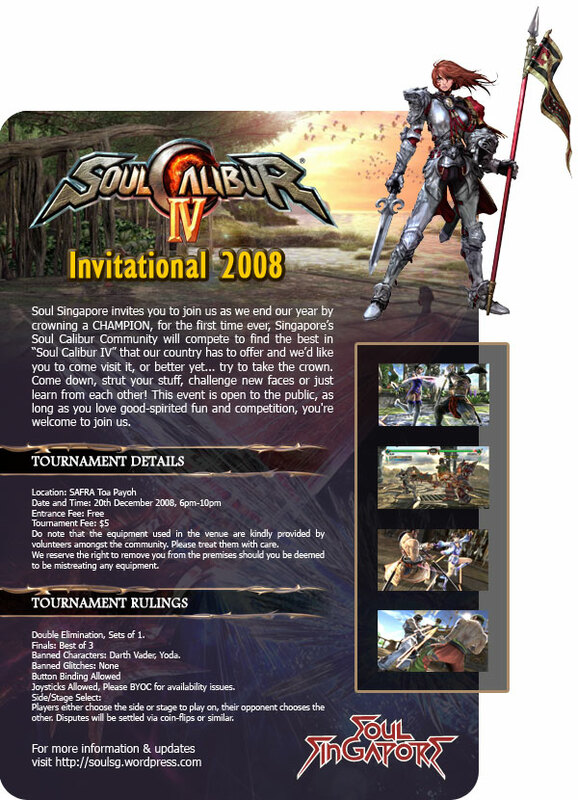 This entry was posted on Wednesday, November 26th, 2008 at 9:51 pm	and tagged with Casuals, Consoles, Playstation3, PS3, SAFRA Toa Payoh, Soul Calibur IV, Soul Singapore, Soul Singapore Invitational, Tournament, Xbox360 and posted in Community, Tournaments. You can follow any responses to this entry through the RSS 2.0 feed. actually i was thinking, JJ and Aheda kinda agreed on it too. if a 360 player vs PS3 player, and both are pad users, both shall go with sticks instead. great job farp and aheda!! thank you so much for your effort! about the 360 v PS3 issue, i think hiro’s idea sounds good… any other suggestions? I think a final decision will be made amongst PS3/Xbox360 pad users at the event day itself. Players who intend to use those controllers, please think about your decision should the problem arise. Random console, or both use sticks. I still think that the winner should win a prize? Perhaps i will bring some friends for this event just for fun.